Back in February, Verizon did a big re-shuffling of its More Everything data plans that included the introduction of a bunch of new tiers, $10 discounts on many, and slight increases on a few. This morning, they did another big shuffling that wiped out many of those new plans, brought back others, and kept the $10 discounts. Let’s talk about what’s new, gone, and what stayed the same. 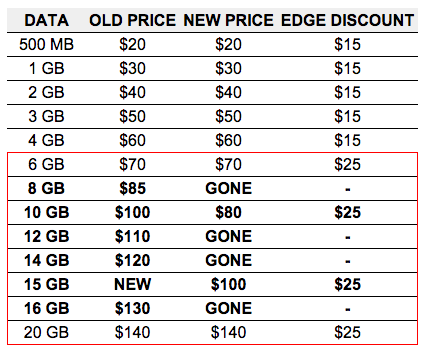 The 500MB to 4GB plans are all still here at their February prices, as is the $15 Edge discount that accompanied them. We also still have the 6GB and above limit for the $25 Edge discount, the 6GB plan at $70 and the 20GB plan at $140. That’s what stayed the same. As for changes, the 8GB ($85), 12GB ($110), 14GB ($120), and 16GB ($130) plans are all gone, even though these were all new just a couple of months ago. In their place, we have the 10GB plan dropping back to $80 (from $100) and the return of the 15GB plan priced at $100. Previously, this pricing on the 10GB and 15GB plans was promotional and temporary, so it may not stick around for long.